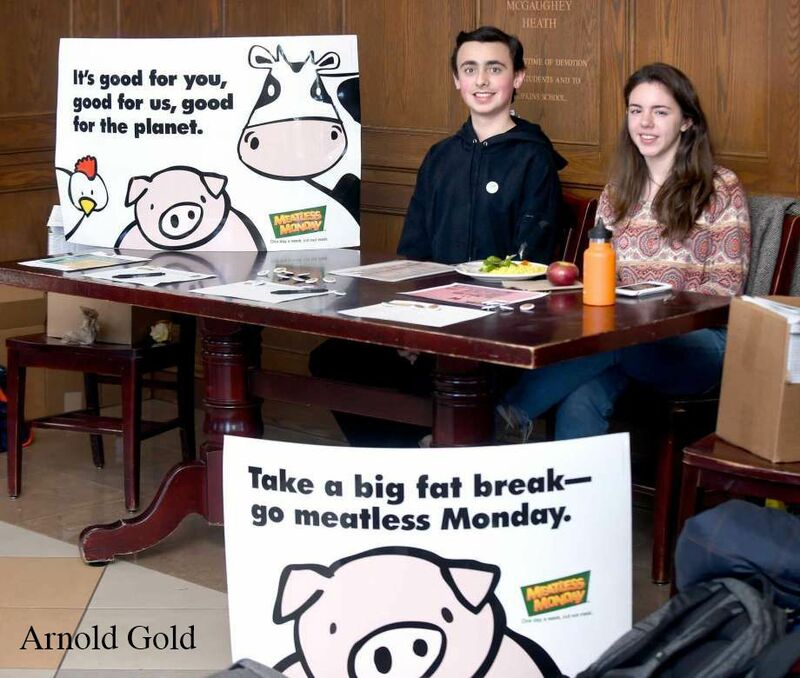 Sophie Sonnenfeld ‘21 and Jack Kealey ‘21 encourage fellow students to take the “Meatless Monday” pledge. A general reaction to learning that someone is vegan is “Why? How?” but the vegans at Hopkins are used to these questions. Veganism is a lifestyle which excludes all forms of exploitation of and cruelty to animals for food, clothing or any other purpose. Madeleine Walker ’19 was inspired when “I visited a place called Farm Sanctuary, which rehabilitates animals that have been abused in factory farms and puts them up for adoption. It was super informative and I have always loved animals (I live on a small farm) so I thought it was just the next step in my life.” She eased into it, starting off by being a pescatarian, then vegetarian, then vegan, which she has been for the last five years. She explained that vegan- ism has “become kind of an identifer at this point,” with her friends putting in her contact name on their phones as “a carrot emoji, or a cow emoji and an X mark, or “Carrot Tofu” because I’m a ginger and like tofu,” and Walker happily accepts that, as she put vegan jokes on her Student Council campaign posts and laughed at Deepak Gupta’s roasts during Assembly. These positive jokes have led Hopkins to be aware of veganism, and Walker is proud to be a leader of the vegan ideas. “My friends defnitely bring up my veganism more than I do, which I fnd hilarious. I also ALWAYS have vegan snacks on me, so my friends are constantly joking about how they’re going vegan just because they ate one of my banana chips or part of a protein bar,” Walker recalled. Although Kealy does not like imposing his vegan beliefs on other people, he did have a fun experiment with Canny Cahn, English teacher and Razor Advisor: “One day I baked a lemon blueberry bread that had a huge hunk of tofu in it, and it was delicious. I had a fellow (non-vegan) classmate give it to Ms. Cahn [who hates tofu] as a gift, without mentioning the ingredients.